Shockspital performs factory-authorized service on mountain bike suspension and hydraulic disc brakes for local and mail-in customers. Need a fork overhaul? Rear shock rebuild? Brake bleed? We've got you covered. We provide service for both consumers and shops. Mail-in customers rejoice: we are conveniently located in Minneapolis, right in the middle of everything. Read our helpful diagnosis guide to determine if your fork/shock is due for service. Visit our Service Page to find out how much your fork/shock will cost to service, or whether we can even fix it. If it's not in that list, we probably can't work on it. If in doubt, please call or email us with any questions. Keep up with the latest happenings on our blog and Facebook page. Most suspension manufacturers recommend having your high-performance suspension components rebuilt at least once a year, if not more. Servicing your fork and shock regularly not only extends their lifespan, it also keeps them performing their best. Though you might not notice the gradual loss of performance that occurs over time, you'll be amazed by how much difference a simple cleaning and oil change can make in the performance of your fork/shock. If your suspension hasn't been serviced recently, it's holding you back. Get the most out of that fancy mountain bike by keeping it in good shape—send your suspension in to us for a rebuild. We are a certified Double Barrel Service and Warranty Center, providing both warranty service and routine maintenance for the entire line of Double Barrel shocks. We are also a Double Barrel Demo Center! Want to test-ride the best rear shock on the market? Check here to see if we have your size. Contact us if you don't see the size you need. Not in the Minneapolis area? No problem! We can mail a shock to you with mounting hardware for your bike (U.S. customers only). Does your Lefty/Headshok need attention? 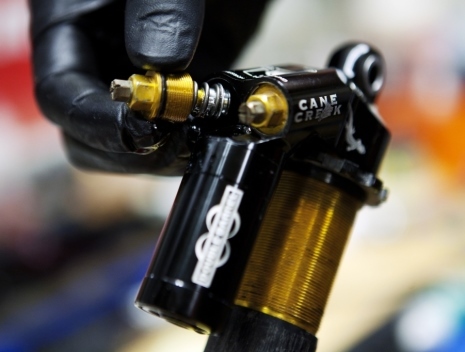 Look no further—we are the national leader in Cannondale suspension service! We have service parts, dampers and hard parts in stock for all modern Lefty/Headshok forks. Ask about our damper upgrade options. Go to our Service Page to find yours in the list. Forks and shocks older than 2008 can be tough to find parts for depending on the model—contact us before sending in something older to make sure we can still repair it. Shockspital is owned and operated by Freewheel Bike. Though the Main Lab is at the West Bank location, we have technicians at each of Freewheel's locations. 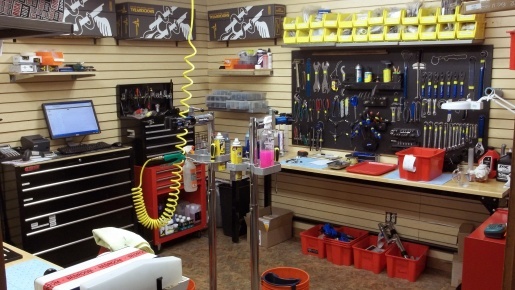 Tyson Acker spends all of his time in the main lab at West Bank servicing Fox and Cannondale suspension products. When he's not fixing bikes he's writing computer programs that make Shockspital run smoother or helping his co-workers get things off the top shelf. Tyson Meyer is the Service Manager at the Eden Prairie location. Tyson Meyer is a well rounded mechanic with a loyal fan club that would make Justin Bieber jealous. Joe Reeves holds down the Shockspital fort at Freewheel's Midtown Bike Center. Sean Collins is the newest addition to the Shockspital crew and spends his time at the main lab at West Bank.